The term “adaptation” describes the translation of a text from one form into another. For some readers, texts lose much in the transition, with adaptations failing to equal their sources’ quality. However, in a Darwinian sense, adaptation allows organisms to endure environmental shifts. This alternate view suggests that, in the words of Robert Stam, adaptations “help their source[s] . . . ‘survive’ . . . changing environments and changing tastes . . .” (3). This class examines the theory and practice of cinematic adaptation. Our investigation will move beyond limited comparisons of “good” originals and “bad” adaptations. Instead, we will focus on the dialogue between multiple versions of the same story, asking how and why film adaptations modify their sources in a particular manner. To do so, we will examine adaptations from around the globe, beginning with multiple versions of Hamlet, Frankenstein, and Batman, among other texts, and concluding with films from the 2015 Seattle International Film Festival. The first seven weeks of the course will take place on campus; the final three weeks will blend online and face-to-face instruction to accommodate SIFF screening times. 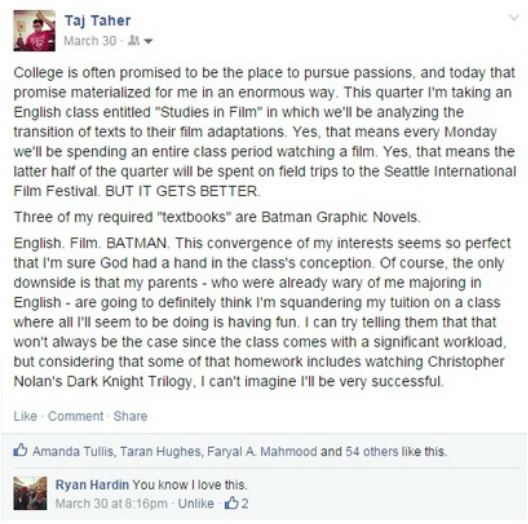 By way of introduction, here's a Facebook status I wrote just before beginning the class. Obviously, I was absolutely stoked for the class (all the more so because that comment on the status is from my absolute favorite English teacher from high school). I'd been waiting to take a class like this my entire life, and let me tell you, it did not disappoint. It actually had even more pleasant surprises for me: one of the "Hamlet" adaptations we watched was a Bollywood film, which is very near and dear to my heart. The class was a lot of work. There was so much dense reading (I was very surprised to find that "adaptation theory" was actually a thing, and that there a vast variety of complex ideologies concerning it...reminding me a lot of ENGL 302 from Autumn 2014) and the writing assignments were not slight by any means. However, it was all work that I loved doing, and it really shows. The quality of my assignments are clearly the labor of love in this class. I loved every minute of it, and it was a surreal experience being in a class where everyone felt the same. The professor, the TA, and almost all the students were film geeks at heart, and it made for an extremely thrilling and engaging class. Our discussions were almost always interesting, and everyone participated, which had been pretty rare in my English classes thus far. This was the first time that I was genuinely inspired by a class. I looked forward to going to class, and didn't feel like it was an obligation. There are classes that are fun, but this was much more than that. This was a joy, I felt in my soul that this is what I was meant to be doing. I can only hope that I'll have another class like this some day, but if not, then I'll only cherish the golden memories from here all the more. "Compelling reason for selection that lays out the contexts and visual elements you'll address in subsequent commentary. You could identify selected aspects of mise-en-scene more discretely (setting, figure movement, composition), but I know exactly where the analysis will go. Exceptionally strong analysis throughout the analytical commentary. 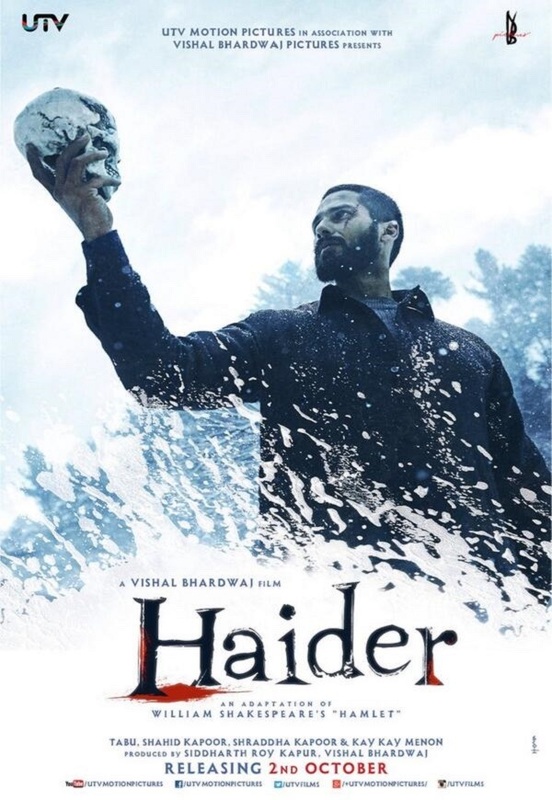 Highlights were the discussion of the political, seasonal, and implied historical significance of the setting and Haider's position as an observer during the puppet show, a composition that reflects his position in the story world events surrounding his father's death. Although I'd argue that his madness begins after he discovers his uncle's role in his father's death, I found your analysis of costume compelling. I'm interested in what you might do with the parallels between the falcon figure/Khurram and Haider. We discussed the Hamlet/Claudius parallels in Shakespeare's version of the Mousetrap scene. Haider earlier wears a mask that looks like the falcon, and only he and the falcon puppet wear a combination of black and bright color. I'd like to use your work as a sample for future courses, with your permission. Given the nature of VideoANT, I can't anonymize your original, but I could copy/paste your comments into an anonymous sample I create. You do a good job of expanding upon the mise-en-scene elements that make the scene so powerful. I'll push back a bit on your claim that these elements don't recur in the film because of the isolated nature of the scene. As you pointed out in your "Reason for Selection," the performance is more organic to Haider than it is in other Bollywood films. We've seen the falcon mask on Haider himself in the wedding scene, and his costuming/props in subsequent scenes (typically black with a pop of bright color from his "mad hat" or the scarf that binds him) call back to the performance. His figure movement also becomes aggressive in a way it hasn't been before, calling back to the parts of the dance where he moves." SO YEAH, I KIND OF ROCKED IT. The first actual essay I had to write for the class I had a little trouble wrapping my head around. It was actually a pretty simple prompt, just analyze the process of adaptation between one of our texts and one of our films in class. But I got caught up in the whole "engage adaptation theory" and tried to bite off a little more than I could chew. The thesis was a little muddled and I struggled with developing a clear line of inquiry. BUT THE ESSAY WAS ABOUT BATMAN SO IT DOESN'T EVEN MATTER. But our final essay for the class was my magnum opus. The prompt asked us to create a film treatment for the one of the texts we had read in class, which was the perfect prompt to really round out the experience of taking the class. I had been mulling over ideas, when one night, in a state halfway between sleep and consciousness, I was struck by genuine inspiration. Like a madman, I burst from bed and began typing away. I was thoroughly impressed with myself: the idea for my adaptation of Frankenstein seemed so amazing, it wasn't just going to make for a great essay, I think it could have actually made for a great film. I'm incredibly happy with the way it turned out, and I couldn't have asked for a more perfect way to conclude this fantastic class.